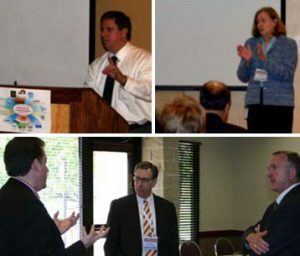 In 2010 the Institute for Transportation hosted a two-day regional transportation workforce development summit. This event was one of several regional transportation workforce development summits held across the United States in 2009 and 2010 as part of a coordinated initiative to develop a national strategy addressing future transportation workforce issues. InTrans Director Shashi Nambisan is part of the national team coordinating this initiative, which is led by the U.S. DOT’s Research and Innovative Technology Administration (RITA). The summit’s sponsors included the U.S. DOT’s University Transportation Centers Program, managed by RITA, and the FHWA. The purpose of Preparing Tomorrow’s Transportation Workforce: A Midwest Summit was to assess the educational and training needs of the future transportation workforce and identify strategies to address those needs across various career paths. It addressed a broad spectrum of topics including strategies to attract women and under-represented minority groups, pre-college opportunities and strategies, post-secondary education, post-college continuing education, professional licensure, and specific industry perspectives. Attendees included college and university-level educators, state agency human resources personnel, undergraduate and graduate college students, adult education experts, various transportation-related industry association representatives, and staff from public transportation agencies at all levels. A national summit to share information from the regional events and develop a framework for the national workforce development strategy is being planned for later in 2011.